I always hated the first days of college courses because they were so boring: professors just read through their syllabi. Blah blah blah you will need to buy this stuff blah blah blah here is how your grade breaks down. I was like, “I can read this myself” (obviously I wouldn’t), and “this is boring” (still true). As a professor, I have done the thing where I pass out the syllabus and say, in my affected “I’m like you; I’m cool” voice: “I know you guys can read and will do so on your own time.” But then I also spend The Whole Semester, like everyone else in my profession, answering questions that are answered by the syllabus. I will have that annoyed-professor tone that we all get when we do that. There are tons of memes online about this very topic. There are even t-shirts you can get, which I’m actually going to get. So then I did the thing where I read through the syllabus like my own professors did. It was boring and it also did little to relieve me of having to answer questions about things that are already in the syllabus. It felt like I was participating in the cycle-of-abuse thing that academics do when they get a little shred of power. I had promised myself I’d never do that, yet here I am. Though I also inflict vocabulary and pop quizzes and assign reading logs and talk a lot about MLA format too, I try to limit the ways in which I relieve my own suffering by imposing it upon other people. So I’m not going to stage a performance of Milsom Reads Her Own Syllabus with Pauses and a Wagging Finger for Occasional Effect this year (which describes a lot of what I have experienced to be Pedagogical Approaches of Illustrious Academics). I have been teaching for a decade now (💥🌈🥂), and on that basis I’m going to say that it’s a lost cause: I don’t think there is any way to avoid the fact that you are going to say things and then repeat them to students who will then ask you them again. 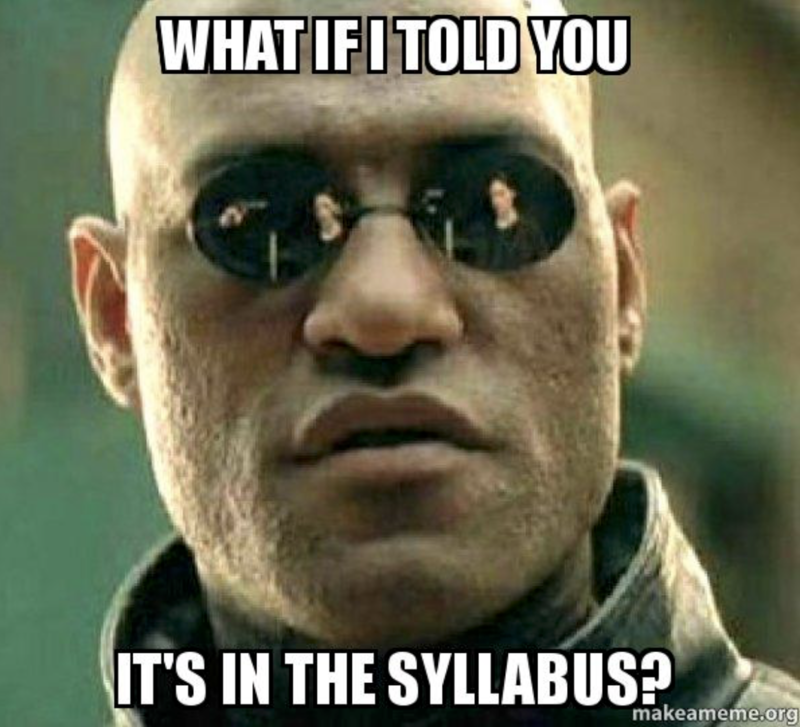 “It’s in the syllabus” somehow doesn’t mean that anyone is going to know it by heart or even want to reference it. It’s relatable anyway. It’s like when I open the fridge and ask my mom where the mustard is even though I know if I spent more than .3 seconds looking for it, I’d find it on my own, and I also know she’s going to just yell at me to look for it yourself. Maybe there is something Freudian going on in this after all? Maybe we just want to . . . interact? If you get a “D” in a course, will that course be transferable to a 4-year college? Can you request an extension the day before something is due? Why does Milsom require you to have a “Calendar” for her course? Also, I find that this Scavenger Hunt has been the best way for me to ensure that the students have been held accountable for reading the syllabus, and I find that it does not require me to read it aloud for them. Make them write down what page each answer can be found on. Make the whole group stand and come to the front of the room to present. This tells the students that they will have to get used to moving around in your class. Even the students who don’t plan to speak during the presentation will still feel like part of the group. If the whole thing can’t be finished in one class period, it can be a homework assignment. Include funny questions in the Scavenger Hunt. Give everyone an “A” or 100% on the assignment as long as it is complete. Starting things off with a big win makes even the most vulnerable students feel positive about the class.